They say, until the lion learns to speak, the tale of the hunt will be told by the hunter. We want to give the lion its voice back and an audience. Our vision is to help Afrikans find their authentic voice so they can tell their own stories. Founded by duduzile zamantungwa mabaso in 2011, Black Letter Media is a full service print and digital publishing and bookselling company. Black Letter Media focusses on publishing new African storytellers who have a unique, powerful and alternative vision of Africa. Our readers can enjoy beautifully designed books in print or as ebooks. Black Letter Media is rooted in the poetry genre. In our first year, we have published two print edition of our online poetry journal, Poetry Potion, as well as two short story titles. But this is only the beginning. Our platforms include poetrypotion.com, and books including the Poetry Potion quarterly, short story collections and novels. Our writers and publishers are primarily from South African but include Nigeria, Uganda, Cameroon, Kenya, Zimbabwe, Uganda, Cameroon and Botswana. duduzile zamantungwa mabaso is a poet, scriptwriter, editor and publisher. She is the founder of Black Letter Media – www.blackletterm.com – where she is working to publish new voices out of Africa in print and online platforms such as the online and print poetry journal Poetry Potion. She has written scripts, storylined, edited for South African television shows such as The Queen, Uzalo, Muvhango, Soul City, Tempy Pushas, Mamello and It’s Complicated to mention a few. She is an alumni of Durban Talent campus, a top 60 SAB Kickstarter, a Mzansi 100 Young Independent and an urban recluse. Thabo Jijana joined Black Letter Media as a publisher in 2017. 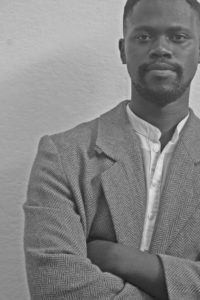 His writing has appeared in Chimurenga, Prufrock, Illuminations 32: Special South African Issue and Tyhini (2016), the yearly journal of creative writing from Rhodes University, where he studied for his MA in Creative Writing. He is the author, most recently, of Failing Maths and My Other Crimes, a volume of poetic attempts in bits and pieces, which was awarded the 2016 Ingrid Jonker Prize. He lives in Johannesburg.